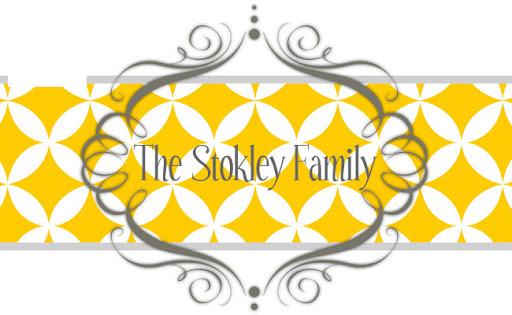 The Stokley Family: Parties, Parties and more Parties!! Parties, Parties and more Parties!! We are Partied out! We have had party after party after party to go to this past week. Thursday I took off work to join Tanner at his School Christmas party. It was a lot of fun and he was glad I was able to go. Pleas check out this picture below...This is him with his class. He is a GIANT! My friend Courtney said he looks like Buddy the Elf! :) I'm so so so glad he's going to be tall! Maybe he'll be tall and coordinated and make us millions in baseball or football! He did not like the reindeer hat! They played games, ate and exchanged presents at their party. They also put on a little program of songs as well. Tanner doesn't care to much for singing so he just stood there most of the time. Thursday night we had Christmas at my best friend Lindsay's house with her parents. It was a lot of fun. They cooked dinner and we exchanged presents with them. Unfortunately my phone was dead that night so I didn't get any pictures. They are so sweet though and we were so happy to be invited over! Friday was Ryleigh's Christmas party at school. What happens when you send a dad to a school Christmas party?? You end up with NO pictures. So just imagine Ryleigh having a good time at her party! Friday night we had our annual Happy Birthday Jesus Party at Nana's. We have been doing this for forever and it's always so much fun! This picture of Ry and mom didn't turn out very good but I liked how bright their shirts were. 3 of the 4 great grandchildren....when are you going to be adding to this number Lindsey?? I'm ready to be a aunt!! Nana and all 4 of the great grandkids. Faith is our little miracle baby and she is so cute!! Singing Happy Birthday to Jesus. I heard this on the radio the other day...there was only 1 Christmas, the rest are just anniversaries. I kinda liked it! Sunday night we had a Tacky Christmas Party/Wedding Shower to go to. Aunt Lisa kept the kids for us while we went. It was a lot of fun. This was the first party like this we had ever been to so we didn't dress up to much. Next year I'll be much better prepared! Here is Courtney and Ward. Or as Ryleigh and Tanner call the Co Co and Pooter Tooter! They are getting married in March and it was their wedding shower. They LOVE a good theme anything! Our friends Leslie and Blake who are getting married in April. I thought they looked really cute! Ryan and I. Ryan's tie was hilarious!! He looked so ridiculous in it! he wouldn't even get out at the gas station to go get a red bull. He made me do it! Court and her mom. I LOVED her veil that her mom made for her to wear at the party. Courts dad also looked really cute. He had a hunting short that had deer all over it. Well he got little red balls and glued them to all the noses on the shirts. It was priceless! Traveis and Mck. His shirt lit up which was funny and I loved the balls on her head! Last night we went out to eat for Ryan's Birthday with a lot of our friends. It started out small but we ended up with 16 people! Thanks to everyone who came we had a lot of fun hanging out with everyone. We went to Buffalo Wild Wings and were dominating in their Trivia game. We left before it was over or we totally would have won! 3 of the cutest kids ever! After dinner we went to this new place called Chill by Krispy Kreme. If you haven't been there stop what you are doing right now and go. It was so fun! Traveis and I had been to one in Bham but you know Mobile is the last place to get anything. It's a frozen yogurt places where they have like 30 flavors you pick from and like 100 toppings to choose from. Then you go up and weigh it and pay by the ounce. It's reasonably priced unless you get the biggest one ever like Ryan...then it's $9! They just opened on Friday and we got to meet the owner. They took some pictures of the kids eating to use in their advertising and then took a group picture of all of us to use. So I'm sure it goes without saying I am partied out! We have nothing planned between now and Christmas Eve so I'm just going to enjoy hanging out with my crew. I probably won't blog anymore until after Christmas so I hope everyone has a very Merry Christmas!